What a beautiful weekend, despite a little rain. We did have a short down pour on Saturday. For the most part, the weather held out for the parties and the parades. Lopez Memorial Day parade was the best ever. Thank you, thank you, to the Mildred Fir Co. for traffic control. It was so nice to be able to hear what was going on without vehicles and motorcycles whooshing through town making a lot of noise. Thank you to Rep. Tina Pickett, our speaker, who did another fine job with her speech. Thanks to everyone who took part in the parade and to the many, many spectators that made this a special event. See you next year. Congratulations to Jaron Williams for making the Dean’s list at Penn College of Technology in Williamsport; Bachelor of Science, Manufacturing Engineering Technology. Congratulations to Jacob Williams who was inducted into National Honor Society last week at SC High School. Thanks so much to Barbara Andrewlavage for again making and donating the wreath that was placed at the Monument during our Memorial Day service and for donating the beautiful flowers and flags that were placed at the Monument and the Lopez sign. They look so nice and it is appreciated by all. Tony and Patti Sneidar, along with Forest, Philadelphia, enjoyed some time over the Holiday at their home on Church Street. Marty and Dee Whatley, Philadelphia, spent the Holiday at their home on Route 487, Lesterville. TJ and Alison Lowden, along with Wesson, Marlton, NJ, spent a few days over Memorial Day at their home on Church Street. Their friend, Kevin Dougherty, Marlton, NJ, was also here with them. Gerry and Paula Weslowski, Allentown, had an enjoyable Holiday weekend with their daughter, Nina Weslowski, and Brian McGuire, Main Street. A little over 100 friends, neighbors and family gathered at Lopez Campground on Sunday for B’s Annual Turkey Smoke, hosted by Brian McGuire. There was an abundance and variety of good food, along with trash can turkeys, hamburgs and hot dogs to please the palate; and enough refreshments to whet your whistle. There were volley ball games, the “mud pit”, swimming in the creek, and lots of visiting. The evening ended with “BOOM BOOMS BY B” that was an AWESOME display of color and sound , with a few rain sprinkles that didn’t dampen anyone’s fun. The weather was perfect all day. Everyone looks forward to another great time next year. Bob McGuire, Jr. and son, Tyler, Hunlock Creek, were up Sunday to visit Bob and JoAnn McGuire and had a nice time at Brian McGuire’s picnic. There were some of the Borick “offspring” down at Tent City over the Holiday weekend. Had a great time while they were here. Safe travels to Ted Lowden and three friends who are on a six week motorcycle trip to Alaska. He’s keeps in touch through Face Book, so it’s nice to see where they’ve been and where they are. Enjoy!! Happy Birthday wishes to Shelly Craig, June 1st; Lydia Stasiak, 5th; Fay Puzo, 6th; Stan Stasiak, 7th; Lynn Malkemes, 8th; Gus Tamburro and Matt Dayton, 10th. Hope you all have a nice day. Happy Anniversary to Stanley and Kathleen Stasiak as they celebrate 41 years on the 6th. Congrats. From Mr. Neubauer’s little brown book: May 30, 1982 – cloudy, warm and 56 degrees. I think we had that beat by quite a lot; it was hot, breezy and probably way above 56 degrees. I’ll take it. Next Civic meeting will be Tuesday, June 21st, 6 p.m. at the Township Building. Should be warm enough soon to have the meetings at the Pavilion. Guess that’s it for now. Enjoy this beautiful weather; the week is to be really nice. 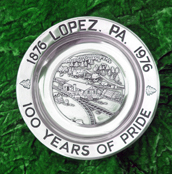 Have news call me at 570-928-9238; mail me; see me; or email me at news@lopezpa.com. I’ll get it in for you. Notice this is a new e-mail address. Thanks for all the hints and tips; they seem to be enjoyed by all and a lot have been tried.